Share the post "RCE Agent Jenny Carleo Wins National Award for Creative Excellence"
At left, Stacey McCullough, president of the National Association of Community Development Extension Professionals (NACDEP), presents Jenny Carleo with the 2016 JCEP Award for Creative Excellence at the NACAA Conference in Little Rock, Arkansas. 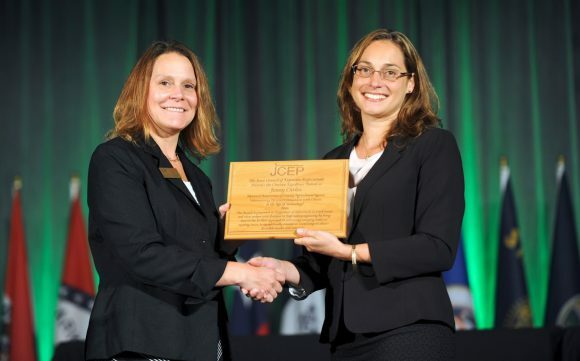 Jenny Carleo (CC’99, GSNB ’03), Rutgers Cooperative Extension (RCE) agricultural and resource management agent for Cape May County, received a 2016 Joint Council of Extension Professionals (JCEP) Award for Creative Excellence at the National Association of County Agricultural Agents (NACAA) conference in Little Rock, Arkansas. JCEP, a partnership of Extension Professional Associations, presents its award for Creative Excellence to recognize individuals or small teams and their unique contributions to Extension programing by being innovative in their approach to addressing emerging issues or existing issues in exceptionally creative or novel ways to obtain desirable results and outcomes. Carleo’s award was for demonstrating how she was able to maintain a personal connection with clients in the age of technology, which she does by engaging the audience as co-creators of their own learning through interactive activities. “I enjoy taking important yet “boring” material and bringing it to life, especially in the areas of pesticide safety and business planning, both critical issues for farmers today,” she says. Her “Pesticide Safety Quiz Game,” an educational program that Carleo developed using audience engagement methods, is an interactive PowerPoint designed to emulate the popular TV game show, Jeopardy. She later developed another game that she called, “The Hot Potato Challenge,” a game that utilizes country music, throwing a ball and audience response technology “clickers” to engage all members of any sized audience in pesticide safety education. In 2016, she used a live boxing enactment demonstration to show the significance of rotating pesticides to prevent pesticide resistance. “The creativity in my educational program design uses technology wisely by promoting interactions between me and the audience, not reducing them,” she adds. Carleo has been the RCE Agricultural and Resource Management Agent for Cape May County and a Rutgers faculty member since 2006. She earned a bachelor’s degree in agricultural science from Cook College in 1999 and a master’s degree in plant biology in 2003. As state coordinator for the USDA-funded Annie’s Project New Jersey from 2012-2015, she was a key member of the project team that offered farm business management programming to over 700 participants. Carleo, who has worked extensively in floriculture, ornamentals and vegetable production, currently serves as the project director for “Ultra-Niche Crops for the Progressive, New Farmer,” a USDA-funded Beginning Farmer and Rancher Development Program project. The first class in this series, Plasticulture Strawberries, will take place on Sept. 28 from 5:30 to 8 p.m. at Rutgers Cooperative Extension in Cape May County. For additional information, call 609-465-5115, ext. 607.